My fiance and I just bought some new Saloman Hiking boots and have started hiking different trails around the Vancouver area. Below are some pics and descriptions of trails we have recently done. Our first hiking in our new boots and no blisters at all. Our boots were ready to wear out of the box without breaking them in which was very fortunate as this was a 5 km, 2 hour hike. The trail was mostly stepping through tree roots so we had to watch almost every step. We had to climb up and down tree roots through the forest. 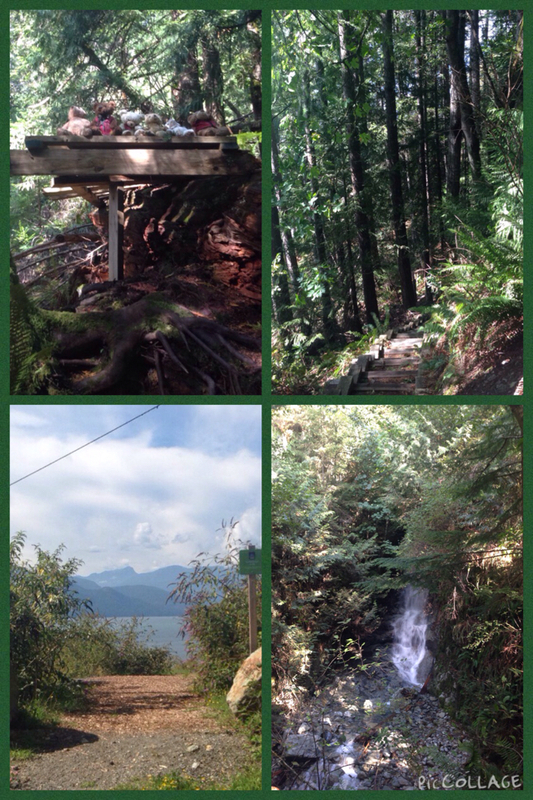 There were cool wooden bridges over streams leading to First Lake. There was an amazing viewpoint at the halfway point (you have to walk back the same way or loop around another trail) overlooking the lowermainland. This was a 4.5 km, 2 hour hike with 175 metre elevation. The trail was fairly easy to walk on however narrow in some areas which were especially notable while zigzagging down the edge of the steep mountain. There was a clearing where we hiked above the highway with an amazing view and lots of blackberry bushes to grab a quick snack. We then arrived at Crystal Falls where we ate our lunch on a bench overlooking the falls. After the waterfall it was a steep incline which seemed like a neverending hike uphill and then more zigzagging downhill. 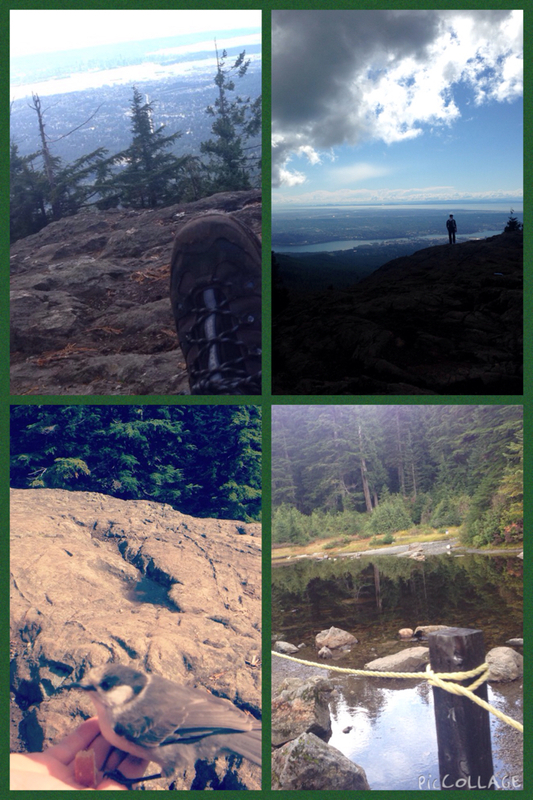 This hike is about 3 hours with 8 km and 110 metres elevation gain. Half of the hike is around the lake and the other half is climbing and descending hills in the second generation forest. The trail was pretty easy to walk on most of it was gravel or dirt and up to two metres wide in some parts. There is a lot of moss and old tree stumps; the view of the lake is awesome. There were people kayaking and fishing on the lake which looked like a lot of fun. 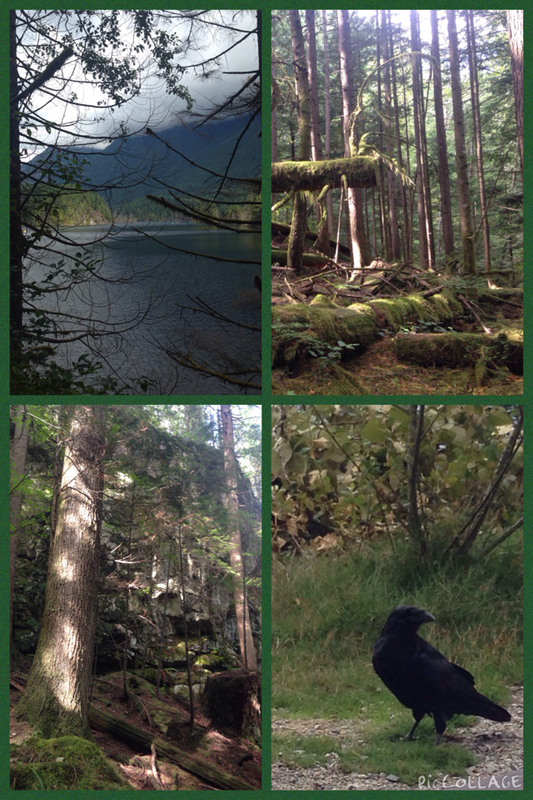 There is a nice beach with picnic benches about half way where a huge raven was scavenging around the picnic tables.